As expected, Xiaomi India today announced the Redmi Y2 as a successor to the Redmi Y1, which was launched just six months ago. Xiaomi stated that the Redmi Y1 was the best-selling selfie smartphone in the last two quarters beating the likes of Oppo F7 and Honor 9i. 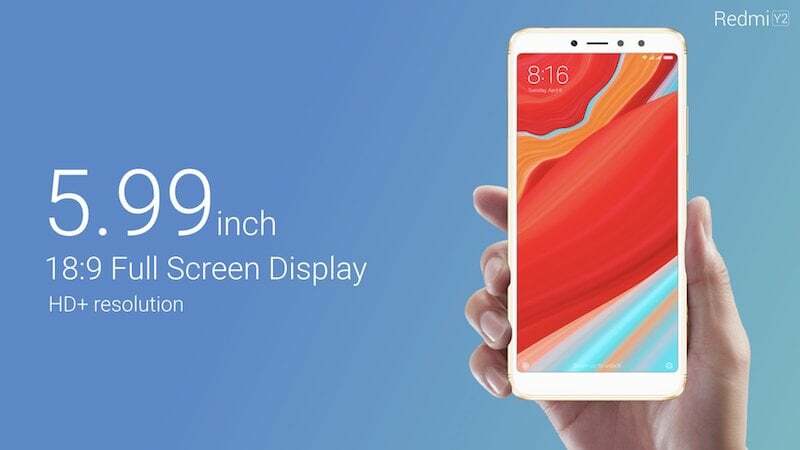 The Redmi Y2 features a 16MP front-facing camera, same as its predecessor and of course, Xiaomi is touting it as the best selfie camera smartphone, which will take on the likes of Vivo V9 and Oppo F7. Also, the phone comes with dual rear cameras of 12MP and a 5MP secondary camera. The Redmi Y2 is the same Redmi S2 smartphone that was launched in China last month. The Xiaomi Redmi Y2 features a 16MP selfie camera with 2.0µm, HDR and LED flash. Xiaomi says that the Redmi Y2 is AI-Selfie superstar as it comes with modes such as low-light selfie, auto HDR, AI-Beautify and AI Portrait Selfie. To the back, Xiaomi has added dual rear cameras- a 12MP primary camera with f/2.2 aperture, 1.25?m, PDAF is paired with a 5MP depth sensor. The rear camera also comes with Electronic Image Stabilisation and LED flash support. The Redmi Y2 measures 8.1mm in thickness and has a weight of 170grams to it. The smartphone flaunts a 5.99-inch HD+ display with a resolution of 720 x 1440 pixels and 18:9 aspect ratio. The screen has 269PPI. Under the hood, the Redmi Y2 has the same Qualcomm Snapdragon 625 SoC and comes in 3GB/32GB storage, 4GB RAM/64GB option. Xiaomi has added triple card slot to the smartphone, meaning users can use two SIM cards and a microSD card at the same time. The phone ships with Android 8.1 Oreo out of the box, but with the company’s MIUI 9.5 skin on top. Xiaomi has added a new photo editing tool. The Redmi Y2 draws power from a 3080mAh battery, but thanks to the 14nm processor, the battery life will surely be increased when compared to the Redmi Y1. The fingerprint scanner is placed on the rear side and the phone even ships with Face Unlock feature that works on Artificial Intelligence. The Redmi Y2 offers 4G LTE, VoLTE, Wi-Fi 802.11 b/g/n, Bluetooth, GPS and a micro USB port. Xiaomi launched the smartphone in three colour options- Rose Gold, Champagne Gold and Platinum Silver. The phone will be exclusively available on Amazon at a starting price of Rs 9,999. The 4GB RAM variant of the Redmi Y2 costs Rs 12,999, while the 3GB RAM variant ships at Rs 9,999. First sale of the device is on June 12. Also, Airtel is offering Rs 1,800 instant cashback and up to 240GB of free data. Redmi note 5 has 1080×2160 resolution with 403ppi its viewing is way better than redmi y2. I seriously don’t know how he said this phone is better than Redmi Note 5!!!!! Redmi Note 5 with MIUI 10(if it comes), will be better than Redmi Y2 in every aspect!!!!! All the phones in budget category (below 15000)(except Honor 7X/Xiaomi Mi A1 /Xiaomi Redmi Note 5 Pro) are close to trash!!!!! With respected to Camera I wanted to say!!!! Yeah the company is selling cheap priced phones but trust me the quality is really bad. I bought redmi note 4 as a secondary phone and in just 7 months the power and volume down key became mushy, you have to click them really hard to make them work. Moreover a yellow patch started to appear on the screen at right side, sometimes it gets faded and sometimes it comes back don’t know if it comes bcoz of heat or anything else. Gonna take this to repair center. Now Let’s see how’s are the repair services of xiaomi. Note 3 and note 4 have known quality issues, fixed with note 5. I didn’t face any issues WITH Redmi Note 3 /4 I have bought in last two years!!!!! I have three to four Redmi Note 4 /3 lying around in my house!!!! !